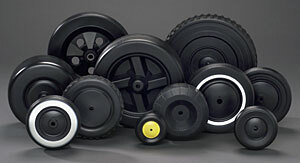 We manufacture custom and standard wheels in black, whitewalls and a variety of colors. Green Bay Plastics can create wheels with diameters ranging form 3” to 12”. Wheel weight and axle size can be changed to customer specifications. We can custom paint and decorate wheels and will also custom pack products to meet our customer’s unique needs. We have the capability to handle multi-million volume orders, but will run quantities as low as 3000.